It’s the day of your dental appointment, and your heart beat is elevated, hands are sweating, and suddenly there is a laundry list of things you need to do instead. Dental anxiety affects a surprising number of patients every year, and is the second most cited reason for avoiding oral health care. At New Image Dentistry, we pride ourselves on offering patients gentle, expert dental services in a comfortable and inviting environment, but for some patients, even the most relaxing environment isn’t enough to reduce stress or anxiety. For those patients, we offer a variety of sedation dentistry options, so even the most anxious patient can relax and receive the dental care they deserve. New Image Dentistry offers San Antonio area patients oral conscious and intravenous (IV) sedation. Both methods have their own benefits and side effects. Consult with your dentist, to determine what method would most benefit your smile. Oral conscious sedation is a great option for patients with severe dental anxiety because relaxation begins before they leave home. The dentist prescribes an oral medication that is taken at a predetermined time before treatment. Sedatives typically take effect within an hour, and though patients remain conscious as the name implies, they report feeling very relaxed, sleepy, or as if they are dreaming. Patients will need a friend or family member to drive them to and from their appointment as the effects of oral conscious sedation are long lasting. Most people are able to resume daily activities the day after their appointment. IV sedation is administered via IV during the dental procedure. This sedation method offers similar effects compared with oral conscious sedation, but the dosage can be adjust throughout treatment to maintain optimal relaxation and comfort throughout the procedure. Like oral sedatives, patients who choose IV sedation will need a friend or family member to transport them the day of their appointment, and should plan to resume daily activities the next morning. 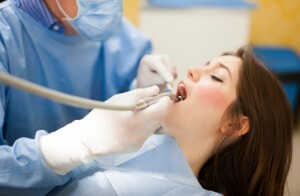 Are you interested in finding out more about your sedation dentistry options in San Antonio? Contact New Image Dentistry to schedule a dental sedation consultation today. Our friendly team is happy to discuss the available sedative solutions, and help you determine the best treatment plan.